The Zoning Board of Appeals on Tuesday approved a proposal that could put a biotech company, or two, in the vacant former School Administration building at 12-30 Central Ave.
Attorney Harvey Rowe Jr. of Panakio Adjusters LLC, representing Central Avenue LLC, told the ZBA Tuesday there are a couple of biotechnology firms interested in moving to Lynn and wanted assurance that biotech would be allowed in the downtown central business district zone. “We’re asking for a written opinion that would allow research and development as an accessory use,” Rowe said. There is no company waiting in the wings to move in, Rowe said, but Steinberg, who is also a principal in RCG, a real estate investment firm that has done a number of projects in Lynn and Salem, said both companies he’s in talks with are seeking clinical space. Rowe and Steinberg declined to identify the companies. Genzyme focuses on medical research in connection to rare genetic diseases and employs about 10,000 people. Steinberg said the companies he is courting are smaller but established firms. He said one company would likely take up two floors with 15 to 20 employees on each floor. The second company would employ about 35. The first floor, Rowe said, will be opened up to include a lobby with a vaulted ceiling and a café. The building also has full basement, which would be used largely for storage. “And for historians, the bowling alley in the basement is gone,” added Rowe, referring to a long ago attribute of the building. ZBA member Jeanne Curley said it would be nice to see the building back in use. Her colleague Patrick Calnan said it would also be nice to see 50-75 people working in the downtown area and patronizing local businesses. The building was home to the Lynn School Administration until it relocated in to 90 Commercial St. 10 years ago. 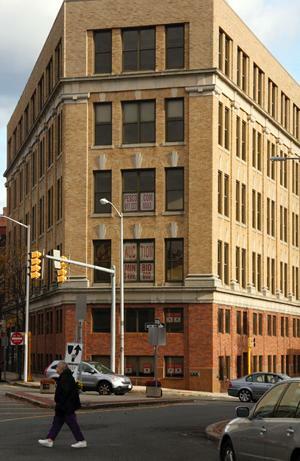 RCG bought the property in December at auction paying $485,000, or less than one-third of its assessed value. Steinberg said “We have plans and an architect,” and work on the building would begin as soon as the 20-day appeal period ends. Economic Development and Industrial Corporation Director James Cowdell is attending a conference in Washington D.C. this week but issued a letter in support of the project, calling it critical to the redevelopment of the downtown. In the letter Cowdell pointed to the nearly 250 new residents living in the downtown area and stated that while it’s good to have people, businesses are also needed. About a year ago, Cowdell said, he and Robert Coughlin, president and CEO of the Massachusetts Biotechnology Council, toured the downtown area and Coughlin agreed it is a perfect fit for biotech. Mayor Judith Flanagan Kennedy agreed with that stance on Wednesday. City Councilor Paul Crowley also expressed support for the project in a letter to the ZBA. “I feel it’s good for economic development and it’s a step in the right direction to rebuild downtown Lynn,” he wrote.